Showing 2 articles from August 31, 2017. LOUISBURG -- The latest renewal of the Franklinton-Louisburg football rivalry somewhat resembled a basketball game -- at least in the beginning. Louisburg tried to contain Franklinton's uptempo preference by attempting to utilize the entire play clock during offensive series. The strategy worked in the first quarter as the Red Rams were only about to run six offensive plays -- and one of those snaps was on a punt. STANHOPE -- Southern Nash and Bunn have competed in their share of backyard rivalry thrillers on the gridiron through the years. This game, however, won't be remembered as one of them. 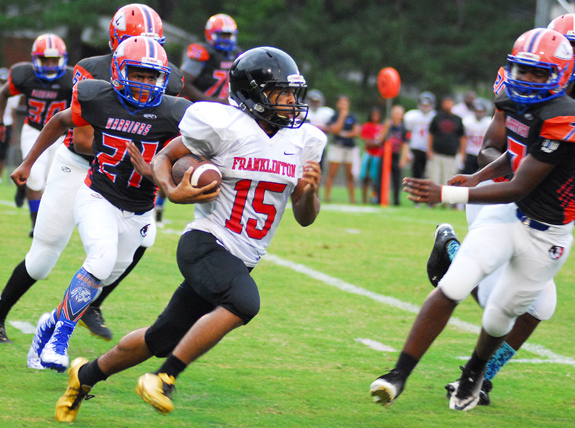 The undefeated powerhouse Firebirds had no problem with visiting Bunn on Thursday, rolling to a 55-7 non-conference decision at Firebird Stadium on the SNHS campus.